Today was Mr Walyaula’s last day with us. He woke me up at around 6am (as he has done every morning this week!!) and asked me to make him breakfast. He had toast with jam, Pringles and has also developed a new-found love for porridge with Golden Syrup. We drove into school early as he had lots of things he wanted to do before he leaves Wales. 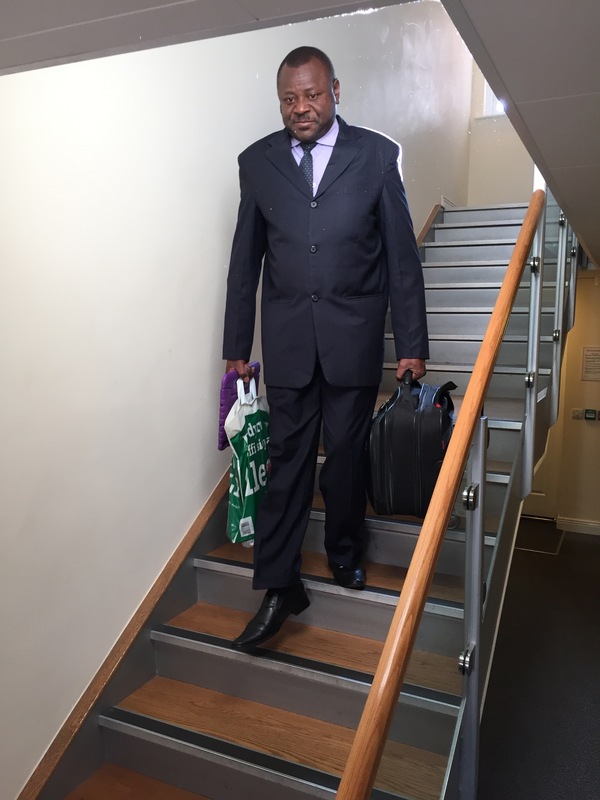 During the morning, he visited the Foundation Phase building to see what African activities they had been doing. They showed him their masks, flags and African shields; he was very impressed! Some classes had even completed lots of research on Africa, using our iPads. At lunchtime, he had fish and chips again, which he loved! Whilst he was busy eating, Mr Mansfield, Mr Prewett and Mrs Orford were on the field working hard with some of the Y6 pupils, setting up for the afternoon ‘African Garden Party’. After lunch, all the children lined up and were brought onto the school field. They sat around in a ‘U’ shape and we formed a stage at the open end, with Mr Walyaula sat on the Eisteddfod Throne, in the middle. We had so many exciting things planned for the afternoon. Mrs Butcher’s class started the afternoon with their outstanding African dance, which they had also performed during assembly earlier in the day. The school choir then performed two of their favourite songs: ‘Siahamba’ and ‘Sing’, led by Miss Browne, who did a fantastic job of conducting them! After the choir, Miss Morgan and her awesome Nursery children showed us some of the things that they have been doing this week. They had painted flags and had even done some African drumming, which they performed for us. Then we had a real treat as Leo from Y5 and his older brother, Lewis, did some African drumming for us! They were excellent and had the whole school clapping along as they played. Then it was time for a real highlight… the ‘Use your head like a Ugandan’ race. Mr Prewett called 9 children out into the centre of the field and gave each of them a beanbag to put on their head. He then blew his whistle and the children had to run to the end of the field and back, without the beanbag falling off. They were all super but Eva in Reception came first place! 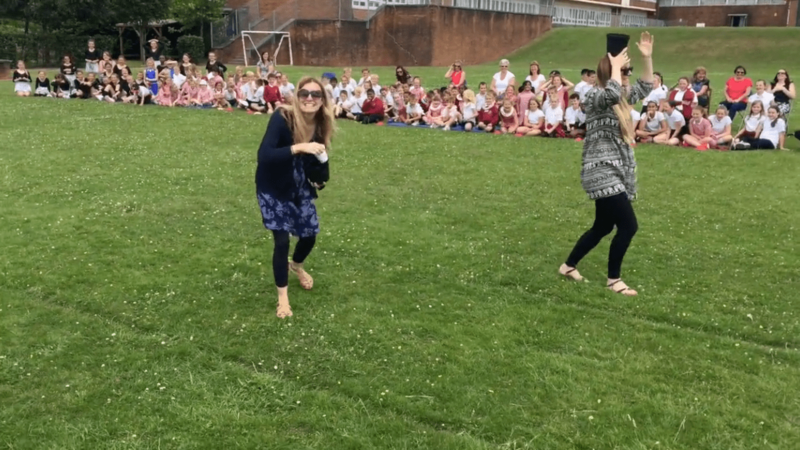 Of course, we felt it wouldn’t be fair to leave the teachers out, so we called Miss Burgum and Mrs Hard out, to take part in our teachers’ race. There was one slight difference in this race, however, because the teachers weren’t given beanbags. They were both given a pot of water to carry on their heads! The children clapped and cheered as Miss Burgum and Mrs Hard moved slowly across the field, trying to balance their pots. Mrs Hard got off to a great start and Miss Burgum struggled to find the confidence to let go of her pot. After 6 footsteps, Mrs Hard lost her concentration and the pot slipped, causing her to get rather wet. The children were delighted and shrieked with excitement. Mrs Hard, who did not share their excitement, then decided enough was enough and started to chase Mr Prewett and I around the field to throw water at us! Thankfully, Mr Prewett was too quick for her, however, she did manage to get Mr Mansfield rather wet! Then our country dancers gave Mr Walyaula a taste of some traditional Welsh dancing. He loved it and particularly liked their Welsh costumes! Mrs Cooke’s Creative Dance group and Gymnastic Dance group then performed their routines from the Newport Dance Festival, earlier this year. He was super impressed with all their flipping and spinning around! With all the dancing going on, we decided that it would only be fair to get Mr Walyaula up to dance also! I called him into the centre of the field and asked him to show us his traditional Ugandan dance. He was somewhat reluctant at first but when our children started clapping him, he showed us the classic Ugandan shoulder shake! At the end of the festivities, we invited Mr Walyaula to the microphone, where he gave a speech thanking us for hosting him and also for the gifts we had bought his school. We were also delighted that Phil and Kath from ‘Pont’, the charity who helped us to organise our visit to Uganda, were able to attend the afternoon.